Standing at the edge of the Newberg High School lunchroom, Quentin Comus and Riley Wood start setting up. A handful of students look on as they prepare to display Wood's senior project: An augmented reality sandbox that measures elevation. With the system up and running and the projections on the sand displaying a variety of colors, the crowd of curious students grows larger – each one taking an opportunity to push the sand around and watch the colors change. When they hover their hands above the sand, virtual rainwater fills the caverns they've created. 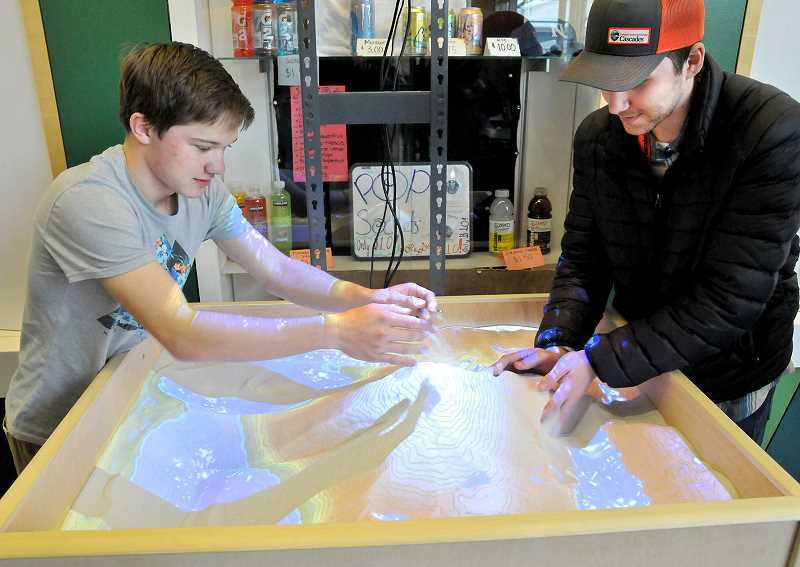 The AR sandbox – part of Comus and Wood's work with the Chehalem Valley Watershed Project – is just the latest in a series of impressive undertakings by a group of seniors at NHS. Comus helped out with the assembly portion of the project while Wood planned it out and will present it as an educational tool. A computer program and an overhanging Xbox Kinect motion sensor measure elevation in the sandbox, displaying colors on a topographical map that change on the sand's surface as it shifts. The physics are all accurate to the real world, including a feature that has water rain down on the landscape, which displays the movement of water as it would appear in reality. According to Comus, he and his classmates wanted to build the sandbox last year but didn't have the time or money. Funding from a variety of grants – like many of the group's other projects – helped pay the $1,700 total it took to construct the project. Now, the finished product will be available for students and educators at NHS and elsewhere. Newberg is only the second school district in the state to have this technology. "We're going to have it at the high school, but soon it will be available to schools and community groups if they want to reserve it," Comus said. "It disassembles and takes about five minutes to recalibrate, so we can take it anywhere." Comus said the watershed project hopes to build one or two more sandboxes in the future in order to rent them out to other schools. They are seeking a geography education grant through the Gray Family Foundation in order to do so. The educational value of the box is evident. Passing students stopped in wonder throughout the lunch period on Thursday and both Comus and Wood explained how the box worked and provided demonstrations. Classrooms will have a use for it in lessons to students of all ages, and it's something cool to have on display and draw on students' scientific interests. The goal, Comus said, is to use the box to teach kids about geography and topography in a fun and interesting way. It's more than a senior project, but it is certainly a memorable one for Wood. "It's part of a larger scheme of bringing more awareness and giving our teachers more tools to teach geology and environmental education," Comus said. "We're really excited about it."